We are the leading supplier and distributor of 5 Seater Spa Bath Tub in India. Potent Water Care Private Limited has proved out to be an industrial leader in the field of Swimming pool and spa. We are the importer and manufacturer of swimming pool equipment and accessories. Working over the past 16 years we have been able to gain a large share of the Indian Swimming Pool Industry. Our quality products and services have enabled us to maintain a dealer network of more than 500 swimming pool dealers across the 28 Indian states. 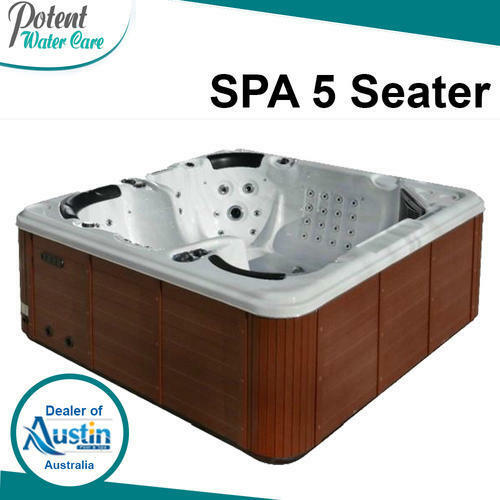 As on today, we are the largest distributor, manufacturer, supplier and trader of swimming pool equipment, accessories, chemicals, Steam bath, Sauna bath, Whirlpool Hot Tub and Water Treatment. Apart from this, we also extend our expertise in Swimming pool construction, swimming pool maintenance, swimming pool repair and renovation. We have a specialised and dedicated team of pool professionals with complete expertise and know how about swimming pools, steam bath, sauna bath, whirl pool spa and water treatment. We are an ISO 9001:2008 certified company having a ready stock for all the Swimming pool products ranging from conventional sand filtration systems to innovative swimming pool Pipe less filtration systems, Swimming Pool Heat Pumps and Swimming Pool Covers. We are the leading manufacturer, supplier and Exporter of world renowned range of Swimming Pool Filters, Swimming Pool Grating, Swimming Pool Under Water Light, Swimming Pool Pipe less Filter, Automatic Swimming Pool Cleaner, Swimming Pool Pump, Swimming Pool Accessories, Water Treatment Chemical, Swimming Pool Filtration, Fountain Lights, Swimming Pool Furniture, Steam & Sauna Bath Equipments and service provider of Swimming Pool Construction Consultancy & Designing.